Which statistical model should we use when examining relationships between variables? It first depends on the type of variables we chose to use for our model: categorical or quantitative. I did some research on the web, and built here a table, summarizing the most appropriate statistical models on the basis of the type of explanatory/outcome variables we choose to include in our model. Hope you will find it useful! 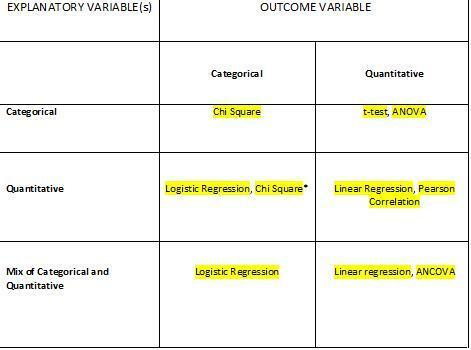 * in case we decide to use Chi Square, we would first need to categorize the quantitative explanatory variable.